In Bolivia, a country in Latin America, the landscapes have been changing rapidly. Where peasants once grew potatoes, pumpkins and wheat and raised chickens and pigs and other crops and animals, now you can only see large fields of just one crop: soy. These lively, diverse landscapes that were also filled with people are now devoid of a human presence. People have been replaced by machines such as large tractors and even planes sometimes spraying pesticides from the sky. But why so much soy? The amount of soy produced has grown rapidly, especially since the beginning of the twentieth century. In the past 50 years the production of soy has grown nearly 11 fold. Industrial farming uses heavy machinery. This type of farming can only work on large fields where a single crop is grown. This is called monoculture farming. Do you know why it causes big problems for our environment and for biodiversity? Read the following stories! Soy is an important source of protein, as the amount of protein you get from a hectare of soybeans is higher than that of any other crop. It is very versatile, which means it can be used for many things: to make food, feed and fuel. Most of the soy, over 75%, is used to feed farm animals. Only 6% of soy is used to make products that we eat directly, such as tofu or soya milk. What is all this soy used for? All this soy has to do with the consumption of meat! Soy is used as animal feed. Bolivia sends the soybeans to Europe. The EU is the biggest importer of soy meal to feed farm animals. In the past, soy was not so important as feed for animals, which instead grazed outside or ate leftovers. With the industrial livestock model employed today, animals are kept inside and fed directly with protein such as soy supplemented with maize and forage. We call these places factory farms. So the more meat we eat from factory farms, the more soy must be produced. In fact, the EU, USA and other industrialized countries have the highest rates of meat consumption in the world. In developing countries meat consumption is rising quickly, but for now is still much lower than ours. Consumption is growing rapidly in countries like China, where currently the average is 58 kg per year. In India the average is only 5.2 kg of meat per person each year. In Senegal people eat 17 kg of meat per year. The developed world on average eats the most meat: a European eats 87 kg per year, an American 120 kg. The twentieth century is often referred to as the “century of meat”. The more frequent presence of steaks and cutlets on our plates is the result of rising prosperity and the boom in the industrial mass production of meat. Meat production has quadrupled over the past 50 years! Bolivia, but also Paraguay, Argentina and Brazil are increasing the production of soy for factory farms in the rest of the world. That means that today, in Bolivia, there are fewer family farmers, lower production of staple foods that people eat everyday and more industrial soy production for export. Do you know Cerrado? Cerrado is the second biggest biome in Brazil after the Amazon Forest and makes up over 20% of the country. Soy plantations and ranches require a lot of land, so not only previous farm land is turned into soy fields – forests are burned down as well. The Amazon Forest and Cerrado are shrinking. This has a major impact on global climate change because Amazonia helps regulate weather patterns all but also stores a lot of CO2. There are about 400 hundred native tribes living in the Amazon, all with their own languages and cultures. Deforestation - in Brazil’s Amazon region, the world’s second-largest herd of cattle meets the world’s biggest rainforest. This is bad news for the forest. First come the loggers, followed by the ranchers. More than 60% of the deforested land in Brazil is devoted to cattle operations. Part of the Amazon is the largest rainforest on our planet – the Amazon Rainforest. It is very important for the global climate, as it regulates rain patterns all over the world. Habitat destruction - nearly half of the plants living in the Cerrado can be found nowhere else in the world and there are also over thirty endangered animal species. However, each year 1.4 million hectares is destroyed for cattle ranching or soy plantations. That is a size greater than the Czech Republic and Slovakia combined! Factory farms can be placed anywhere. They are not attached to land and function like a factory in a linear model. The problem is that when we produce feed on one side of the planet and raise animals on the other side, we break the virtuous cycles that you can observe in most family farms models. In a responsible farming approach, all elements play a role within a system. The manure produced by animals is used to further enrich the soil for producing their future feed. That cannot happen in a linear system. Factory farming is then a cause for the depletion and pollution of soil and groundwater. Meat production also requires a lot of water. The factory farm method uses 15,500 liters of water to produce just one kilogram of beef. A small swimming pool full of water to produce 4 steaks? A surprising amount, until we look at what a cow eats during its lifetime: 1,300 kilograms of grain and 7,200 kilograms of forage. It takes a lot of water to grow all this fodder! Not a rosy picture – so what can we do about it? Did you know that cows also release a great amount of methane when they burp? Livestock production is responsible for more global greenhouse gasses than the entire transport sector! Methane is 28 times stronger than CO2. A huge problem is that factory farms pollute the soil, rivers and groundwater with nitrates and antibiotic residues. This is contributing to pollution of sea water. Be creative in the kitchen! Don’t waste meat – you now know that meat and dairy production use a lot of land and water and leave the environment in a sad state. Far worse is when these products are thrown into the bin in the end. Pulses are often called “superfoods” because they are rich in protein, minerals and B-vitamins. 2016 is the International Year of Pulses – let’s celebrate by replacing some of the meat we eat with more types of pulses. 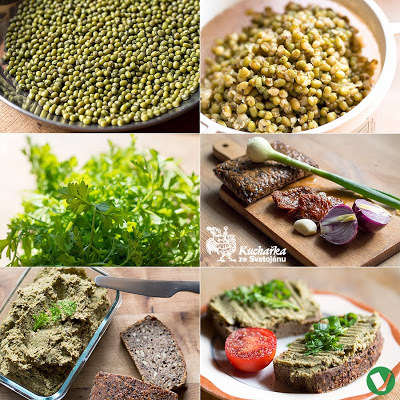 Here are a few delicious easy recipes using pulses for you to try! We thank the inspirative cook from the Czech Republic, Eva Francová, for sharing them with us! Let’s celebrate the International Year of Pulses by cooking them for our families and friends! Soak 100 g chickpeas in the evening and the next day cook them in fresh water until soft. 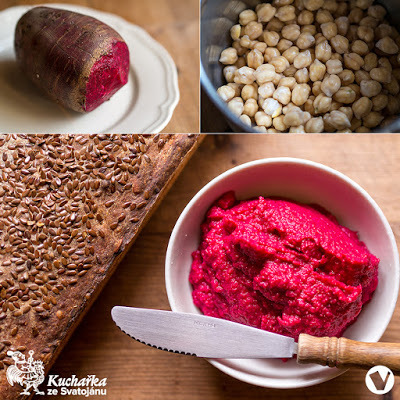 Cook one small beet until soft; let cool and then place in a mixer with the chickpeas, salt, three cloves of garlic, one onion, two tablespoons apple vinegar, three tablespoons nutritional yeast, freshly crushed cumin, pepper and coriander. Blend until smooth, adding water to thin if necessary. An excellent salad made from roasted potatoes. Peel 1 kg potatoes and quarter. Place on baking sheet, drizzle with olive oil and sprinkle with herb salt. Bake until golden. Cook 150 g green lentils until soft. 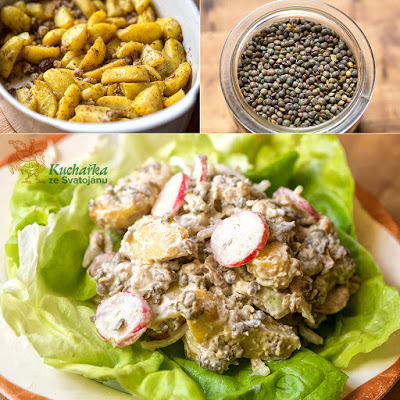 Mix potatoes and lentil in bowl, add 200 g roasted chestnuts, 200 ml homemade mayonnaise (vegans can use soy mayo), salt, pepper, a bunch of radishes, a chopped onion and two tablespoons of wine vinegar. Serve on leaf lettuce as a main dish. Soak 120 g mung beans overnight and cook them until soft with pieces of wakame seaweed in fresh water the next day. Strain the beans and mix with 200 g of smoked tempeh, around five sundried tomatoes packed in oil, a small red onion, a scallion, a bunch of radishes, a tablespoon of nutritional yeast, a clove of garlic, a tablespoon of tamari and a tablespoon of umeboshi vinegar. Add a little water if necessary. Best served on sourdough bread. Heat 2 tablespoons of oil in a pot and sauté 300 g of chopper leek until golden. Add 200 g of iceberg lettuce and 500 g of fresh or frozen peas and cook for ten 10 minutes, occasionally stirring. Add 1.2 l of vegetable stock or water and cook until soft. 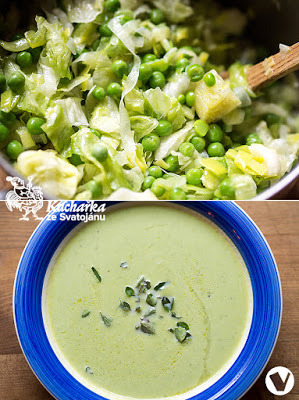 Season with salt, remove some whole peas and mix the soup. Blend in 100 ml of almond cream and return the whole peas to the soup. We’ve revised how much meat and dairy products we eat. Now we can check where the products come from. Were they produced in a way that doesn’t harm the environment? Were the animals able to graze outside? Are they fed feedstuff grown locally instead of in Latin America? That way we don’t need to ship soy thousands of kilometers across the ocean to Europe and the impact of meat production would be less on the planet. Small organic farms are the best source of farm animal products. These farms should ensure welfare for animals, take care of the environment and never use genetically modified feedstuff. The different numbers on our eggs show how the eggs were produced. The lower the number, the better!